Tall Tails Training was conceptualized by Robyn Achey-Zarnas & Bill Gorton in 1992. We began our education process, developed our philosophy and programs and formally opened in 1995. Our goal is to help people learn to have quality relationships with their dogs beyond the idea of “old school” obedience training. Since then, we have educated people and have trained and rehabilitated thousands of dogs across 9 states and 3 continents. Then we were a training business… but our dream was to have the ability to serve the community on a larger scale through boarding as well as training. In 2006, we had the privilege of buying and residing on the beautiful and peaceful Sunset Farm, a 58-acre property with rolling hills, sprawling fields and tree-lined beauty upon which to create our warm and inviting pet resort. After being joined by Susan Gorton (who manages the kennel) in 2006, we now have the wonderful ability to do just that as Tall Tails Training & Boarding! Our staff includes only the finest in kind and dedicated people who are animal lovers (as well as “people persons”!) just as ourselves. We are happy to do anything to provide the highest level of care for the animals as well as the highest in a personable and cheery experience for the families who become part of the Tall Tails Family! Robyn holds a BA in Communication from Penn State University and a BFA in Graphic Design from Kutztown University. She uses her graphic design experience creating Tall Tails’ identity and her communication background creating the canine/human communication programs that Tall Tails offers. She also holds a dog training/behavior certification from National K9 in Columbus, Ohio as well as other animal care and behavior certifications. She is thrilled to spend her days teaching dogs and educating clients. Her relationships with her domestic inside pets and outside farm animals spark the magic that she hopes to share with others and their animal relationships. Bill holds a BS in Chemical Engineering from Penn State University. 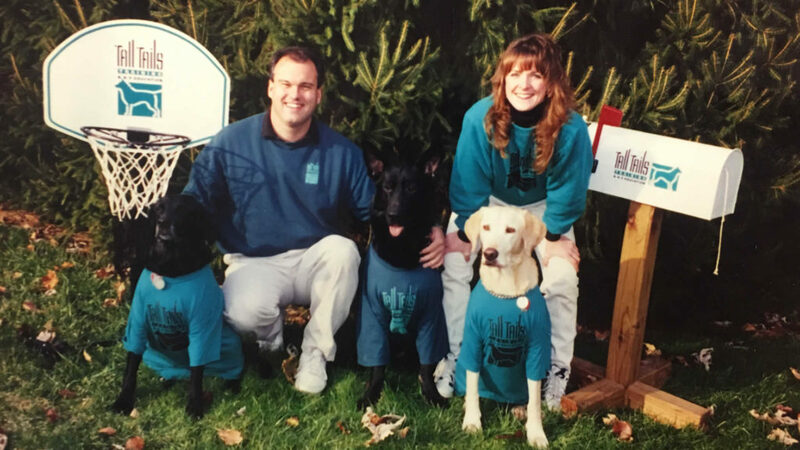 Bill “retired” from Engineering in 1995 to begin studying the field of dog behavior and graduated from National K9 Training Center in Columbus, Ohio in 1995 with certifications in advanced obedience training, protection training, tracking and kennel management. His analytical skills and passion for problem-solving, in combination with his deep love for animals, help keep all aspects of Tall Tails running smoothly with a heart-centered focus. Susan holds a Bachelor’s Degree in Psychology from Boston University and an Associate’s Degree in Baking & Pastry Arts from Johnson & Wales University, as well as several pet care certifications. A former pastry chef, she now helps create the special treats for our “Room Service” Amenities, Holiday Dinners and Snuggle-n-Snack Time. She is delighted to spend her days surrounded by the love of animals and takes great joy and pride in creating a relaxing, loving environment for pets to enjoy when away from home. Mary holds a Bachelor’s of Science in Wildlife Biology from SUNY ESF and a Master’s of Science in Natural Resource Management from Delaware State University. She changed her career path in 2008 to pursue her passion of pet care. Mary has several pet care certifications and enjoys continuing her education in the pet care industry. Mary takes great pride in creating a loving and safe environment for the pet’s vacationing at Tall Tails, not only for the pets, but so that their owners can travel with the peace of mind knowing their pet is loved and having fun.